PhotoClub Scorer enables Photographers to score images from their Android or IOS Phone or Tablet devices. Scoring can be recorded locally, or remotely through a WiFi system, or simple club private hotspot. SINGLE SCORING means that each image is scored by all participants at the same time. MULTI SCORING means that a batch of images can be scored in any order by all participants. Participants may or may not have entries themselves, but scoring of their own entries is automatically excluded. The simplest form of “single scoring” is a judging setup, similar to Photographic Salon selection, where typically three selectors score each image, as it is presented to them, using keypads numbered 2, 3, 4, and 5. The three scores are summed by the system and the results recorded in a table to provide a means of choosing the best images. PhotoClub Scorer provides this simple functionality, for up to six Judges, using an Android or Apple IOS App on each of the Judges tablet’s or phone’s, together with a free Windows "Remote" application installed on the club laptop. PhotoClub Scorer also has the additional functionality to ignore self-scoring by the judges. This is useful for internal competitions where the judges are allowed to enter, but not score their own images, and where an inter-club competition uses representative members of each club as judges. 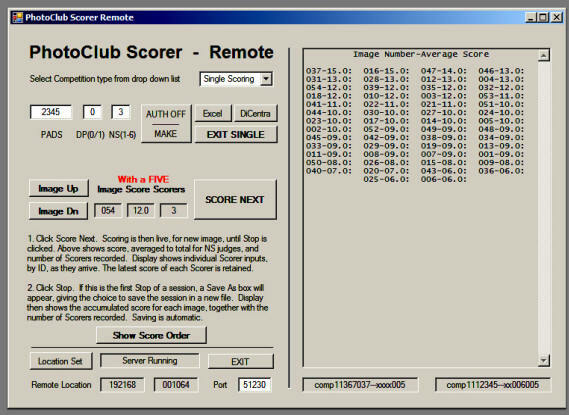 The score outputs can be linked to Excel or Image Presentation Software to display the results and progress the images during the competition. Apps, containing no advertising, can be downloaded from Google Play, or the App Store, and the free Windows "Remote" application is downloaded from the PhotoClub Scorer “visiclef” website. PhotoClub Scorer also expands the concept of electronic scoring to other types of internal club competitions, particularly where the major problem is speedy calculation of the results within the time available on a club evening. An example of Multi Scoring is a print competition, where entrants may enter say three categories, within a total choice of say four, or up to six, sections. Prints are distributed around the club room for viewing and scoring, and an unknown number of images, typically exceeding sixty to ninety prints, will be brought by members on the night. The entry is recorded at the door, using the “Organiser” part of the Android App, listing the images, against their section or category, for a corresponding “Entry Number”, which is marked on the print. This number is allocated to each Entrant, together with a “Club Identity” for later publication of the results. Members without entries are considered to be “Guest Scorers” and are asked to use a Club Identity of 300, with an allocated “Guest Number” for scoring. All scores, from a mix of Android and IOS devices, are sent over Wi-Fi to a remote system which records and displays the accumulated results. This functionality is provided by the Windows application. Where members do not have smart devices, paper forms are provided from which those with devices upload the scores when completed. Most club venues do not have accessible Wi-Fi. A hotspot can simply be a self standing wireless broadband router. Often a club member will have a redundant router, when they have changed broadband providers, or upgraded to the latest faster offering from their current provider. Testing, and experimental setup, can be carried out on any home Wi-Fi system, by downloading the Windows Server application and one Android or IOS app. The download also contains the PhotoClub Scorer User Guide and a Demo Pack with starter competitions and Excel templates.